Annan deservedly lifted another league point on the road against second placed Montrose. A result which was all the more deserved after Annan were reduced to 10 men in the 70th minute when Steven Swinglehurst was sent off for a second yellow card. Annan boss Peter Murphy was forced to make one change from the side which drew with Berwick Rangers the previous week with Scott Roberts starting in place of the suspended Rabin Omar. Montrose were also forced to make a couple of changes following their victory over Cowdenbeath the previous week. Montrose started the game positively winning a free kick on the edge of the box but Iain Campbell’s free kick was bitterly disappointing going well wide of the target. The home fans however were soon on their toes after only seven minutes when the home team went ahead. Craig Johnston done the damage down the right when he skipped past the challenge of Jack Brannan to finish with a near post low cross which Chris Templeton knocked into the corner of the net from close range. It was just the start which home team were seeking. Chris Templeton then almost doubled the home teams lead minutes later when his header crashed against the cross bar from Campbell’s corner kick. 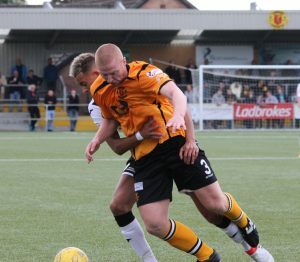 It was a nervy start from Annan but gradually they worked their way back into the game and in the 17th minute Scott Roberts squandered a golden opportunity when he headed past from an inviting Dan Orsi cross, it was an opportunity lost. Annan continued to look dangerous with Aidan Smith shooting past the post.. It was a good period from Annan as they took the game to Montrose and in the 23rd minute Dan Orsi once again did well when he set up Blair Henderson who’s well struck shot flashed past the post. Swinglehurst received his first yellow card on the half hour mark when he brought down Craig Johnston on the half way line. Annan finished the first half on the front foot, Scott Hoopers 40th minute effort went over the bar and Peter Watson’s header from a Sinnamon corner was directed straight into the arms of keeper Fleming. Montrose started the second half exactly in the same mode as they started the first half forcing a corner and in the 52nd minute. Annan had Atkinson to thank when he saved Templeton’s well struck low shot with his feet. It was a promising start to the half by the home team but once again Annan started to get a foot in the match and in the 60th minute Annan struck when they won a free kick 30 yards out. Sinnamon’s free kick was perfectly flighted and caused uncertainty in the Montrose defence and Steven Swinglehurst’s header from 6 yards left keeper Allan Flemming pulling the ball out of the back of the net. Montrose responded minutes later after a promising move saw Campbell setting up Sean Dillon whose well struck effort landed on the top of the net. Moxon was next to try his luck but his 30 yard effort sailed over the bar. Swinglehurst received his second booking in the 70th minute for a challenge on Dillon which saw Ayrton Sonkar being introduced at the expense of Scott Roberts. Terry Masson’s well directed effort struck the top of the cross bar as Annan were being forced to defend as the home team tried to prize open the Annan defence. Peter Watson rescued a potential scoring opportunity hooking Websters effort off the goal line. Dan Orsi opened up the Montrose defence to set himself up but the well struck shot went wide of the target much to the relief of the home team. The game finished with Montrose pushing forward but unable to break down the well organised Annan defence. It was an opportunity lost for Montrose to go top of the league after Stirling could only manage a 1-1 draw at Clyde. Stenhousemuir completed the double over Peterhead with a late winner to secure a 3-2 victory. Edinburgh City and Berwick shared the points in a 1-1 draw at Shielfield. Elgin City moved up to within touching distance of the play off zone with a 3-1 victory over bottom of the table Cowdenbeath. Montrose : Alan Fleming, Cammy Ballantyne, Andrew Steeves, Matty Allan, Sean Dillon, Iain Campbell, Terry Masson (Liam Callaghan 75 min), Paul Watson, Craig Johnston ( Connor McClaren 55 min), Chris Templeton, Jamie Redman (Graham Webster 75 min). Substitutes not used Kerr Hay, Martyn Fotheringham, Gary Fraser, Euan Rose. Annan Athletic – Jim Atkinson, Scott Hooper, Jack Brannan , Owen Moxon, Peter Watson, Steven Swinglehurst, Dan Orsi ( Brandon Luke 90 min), Ryan Sinnamon , Aiden Smith, Blair Henderson, Scott Roberts (Ayron Sonka 72 min). Subs not used Alex Mitchell (GK), James Creaney, Sean Bell, Peter Murphy, John Cunningham. Referee – Lorraine Watson. ​Assistants – Stuart Stevenson and Colin McAlpine. The Royal British Legion was founded by veterans after the First World War and a century on they are still helping today’s Service men and women, veterans, and their families in almost every aspect of daily life. The Montrose branch was formed in November 1931 with members meeting once a month in a recreational hall in Mill Street before moving to Queen Street in 1933. In 1964 the Artillery Territorial HQ in Wellington Street was purchased by the War Office and became the home of the Montrose Branch, where it remains today. The teams on Saturday were led out by the Legion standard bearer, retired Bombardier Ron Blacklaws, a former soldier based at the Artillery Headquarters in Wellington Street and groundsman of 6 years at Links Park back in the 1960’s. Ron will be flanked by Lance Bombardier Lewis Gaskin of the Royal Artillery, Montrose Army Cadet Force and Cadet Flight Sergeant Jamal Ronald of 2288 Squadron, Montrose Air Training Corps.